A SUSPECT in sought in two armed bank robberies in Huntington Beach. Police are asking the public’s help in identifying the man who they believe committed two armed bank robberies – one of them on Wednesday – in Huntington Beach. According to Officer Angela Bennett of the HBPD, the more recent incident took place on May 30 at the One West Bank at 7061 Yorktown Ave. at around 11:15 a.m.
VIDEO CAPTURE of armed robbery suspect (HBPD image). The suspect, described as an adult male in his 50’s, entered the bank, pointed a handgun at employees and demanded cash. 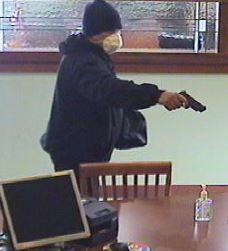 Police believe this is the same man who robbed the First Bank at 501 Main St. on April 30 at about 11:37 a.m. In each case, tellers gave the suspect an unknown amount of money and he fled on foot from the bank. A further description of the suspect is a white male in his 50’s with medium build, gray hair and light blue or green eyes. In both robberies, he was wearing a dark “hoodie” sweatshirt, dark beanie-style knit cap, long dark pants, gray athletic shoe and a white dust mask over his mouth and nose. The handgun was a dark semiautomatic pistol. Anyone with information about the suspect or incident is asked to call the HBPD Hotline at (714) 375-5066. You can remain anonymous by calling the WeTip hotline at 1-800-CRIME.